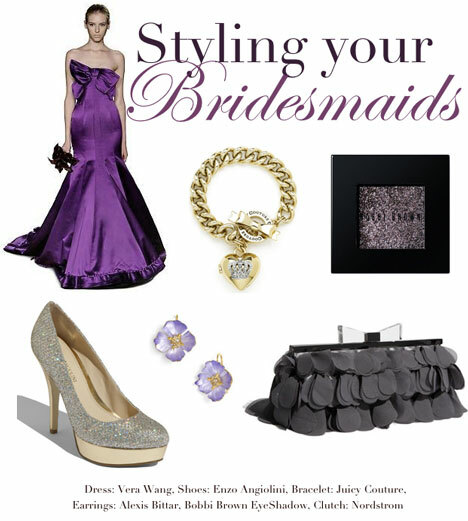 bride.ca | Fashion Board: Bridesmaids' Purple Inspiration! Inspired by yesterday's featured real wedding (Loredana & Gulio in Montréal) our BRIDE.ca fashionista, Monica Hibbs has compiled her own purple-themed styleboard. Check it out, read her comments below. Loredana's choice of bridesmaid dresses is one of my favorite features of her wedding! The purple color added generously to the overall mood of the wedding. Choosing bridesmaid dresses can be tough, sometimes harder than finding your own wedding dress. You have to consider the ladies you've chosen to stand with you... will they love the color? will they feel comfortable? and most importantly, would they wear it again?! When styling your girls, a great idea is to think of an accessory that would look fabulous with their dresses AND act as a thank you gift. I've chosen this beautiful Juicy Couture bracelet, it's not going to cost you a fortune and the girls will love it! Have fun with the shoes, sparkles are so fun right now. I love the addition of throwing sparkles during the couple's first dance (above photo), these shoes fit in perfectly! Other gifts could include matching earrings and makeup such as signature eyeshadow. If you choose to do a statement clutch, replace the bridesmaid bouquets and have them walk down the isle with a fabulous clutch in hand! Purple was the hottest bridesmaids colour in 2010-2011; it looks like it has staying power..